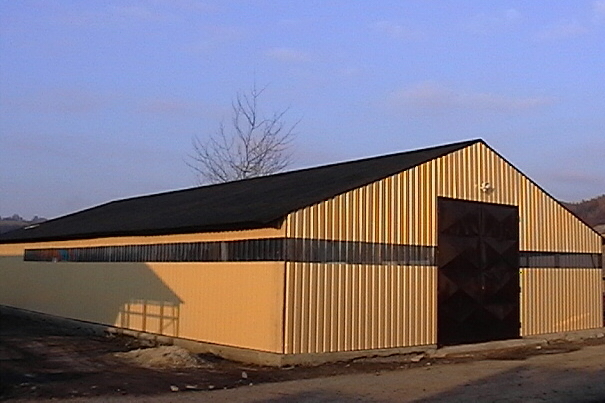 ­Planning and building of forest tree container nurseries | TUBUS Rýmařov, s.r.o. 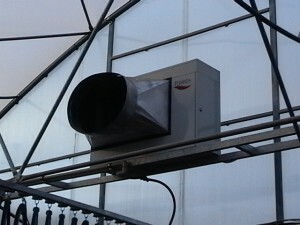 In several recent years, new progressive methods for growing of forest plants in containers become to be used more frequently. Main advantages of these methods lie in higher grow-up rate from the seed of forest tree species, shortened growing period from sowing to the planting in forest tree nursery, but especially almost lossless survival rate of set out containerized forest plants, the possibility to prolong forestation time into late spring or late summer period, young plants do not suffer from transplantation shock and right first year after transplantation they show increased accretion. The time, which is necessary for tending the plantation up to its secured stadium, is shortened approximately by one third and so the financial expenses are saved, which would be otherwise spent for the protection of plantation against weeds, game etc. On the contrary, negative fact is the price of containerized plants, which is in comparison with classical bare-rooted plants slightly higher. The higher price of containerized plants is caused by high investment costs for building of whole new progressive technology. In spite of that, if we compare the expenses for securing one hectare of forest plantation by means of bare-rooted plants and container-grown plants, we find that with using of container-grown plants, the saving of approx. 30 % is achieved in secured stadium of the plantation in comparison with total expenses spent for securing the plantation from bare-rooted plants. So, from long-term economical point of view, the growing and planting of containerized plants is the most suitable variant of artificial reforestation. In such case, when the forest tree nursery procures all seeds independently and treats them independently for storing or for sowing, it is necessary to have the whole hulling technology. However, the forest tree nurseries mostly limit themselves only to the collection of seed of deciduous tree species, possibly shrubs. Here, the seed preparation is relatively simple and undemanding from technological point of view. Only in the case of treating the acorns for sowing into planting plates, it is necessarily to perform besides acorn washing also thermotherapy of acorns and dressing. In order to ensure stable yearly production of forest plants in all grown species, it is necessary to create a sufficient reserve of forest tree species seeds, also in case, when it is expected that not all types of tree species will give fruits each year. In the case of forest tree container nursery, it is more suitable to build own freezing boxes for freezing of beech seed for several years in advance and cooling chambers for short-term storing of seed of some types of tree species for stratification and scarification. Especially stratification and scarification require daily care. Only by means of consistent care and observing the technological procedures for pre-germination of seed it is possible to ensure growing of quality forest plants with highest possible grow-up rate from one kilogram of seed. Before sowing, it is necessary to fill the planting plates with corresponding substrate for growing of specific forest tree species. The planting plates can be filled with substrate manually, but the results are not the best. It is better to fill with substrate in semi-automatic or automatic way in special filling devices. Seed of forest tree species prepared in proper way is seeded into planting plate either manually or, in the case of smaller seeds, in semi-automatic or automatic way. Various fixtures facilitating the manual sawing serve for semi-automatic sowing. 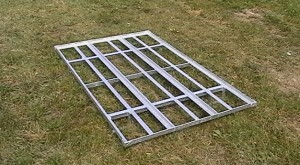 With using of them, it is possible to achieve high effectiveness of sowing. Automatic sowing lines also exist, but they are effective from economical point of view only at large production of plants with small seeds. When the seed is seeded into planting plates and covered, the planting plates are placed on iron pallets. 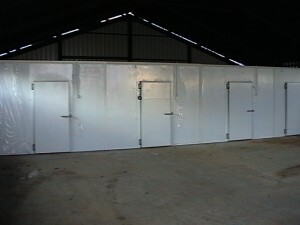 These pallets are transported with using of fork lift into foil coverings. 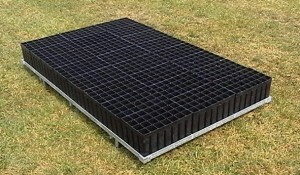 Iron pallets are positioned into plastic greenhouses evenly, so that the area of the plastic greenhouse is used at the best. In such way, that the highest possible number of pallets is positioned here and so maximal possible number of plants for one unit of area is produced. 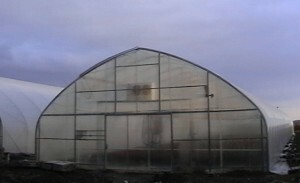 The plants are grown in the plastic greenhouses for differently long time, in dependence on tree species and under almost ideal microclimate conditions they achieve significant accretion in the first phases of growth. 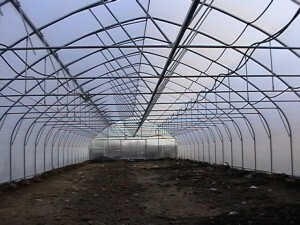 When the containerized forest plants are grown in plastic greenhouse, it is necessary to use bridge irrigation systems for irrigation, which are the only ones that can ensure sufficient and regular dose of irrigation water for each cell in planting plate. 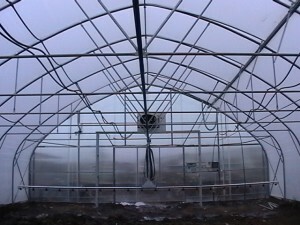 They are also necessary for the cooling the microclimate in the plastic greenhouse by means of fogging and for the spraying of forest plants with fungicides. 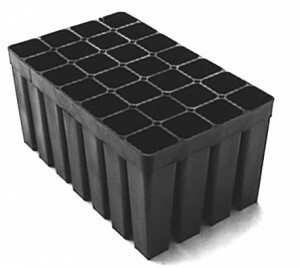 When the forest containerized plants are precultivated in the plastic greenhouse, the iron pallets are taken away from the plastic greenhouse by means of fork lift to outdoor hardened areas equipped with outdoor bridge irrigation systems. Here, the iron pallets are placed under bridge irrigation systems and the plants are grown up to plantable condition. Similarly as when growing forest plants on planting plates in a plastic greenhouse, it is necessary to use bridge irrigation systems, when growing them on outdoor areas it is necessary to apply irrigation, spraying, possibly fogging with using of bridge irrigation system. 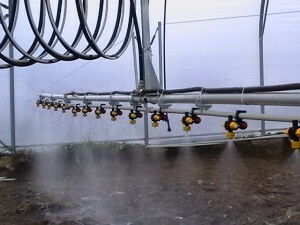 To complete the summary of all devices and needs, it is necessary to mention for example sufficient source of irrigation water in required quality. Pumping station with sufficient output. Quality seed substrates. Well-developed formula for additional fertilizing. Detailed procedures for stratification, scarification and storing of seed before sowing, according to individual tree species, etc. We are able to work out the project for building of forest tree container nursery, including technological project for growing of forest plants and preparation of seed. We build to order complete forest tree container nursery according to approved project, including delivery of all technological units..